Do you need a dessert recipe that will feed a crowd? They learn to PLAN a grocery list and shop for the items. They learn about math and measurement. They use basic kitchen tools and learn the "terminology" of baking. The sense of accomplishment when they have a beautiful creation is priceless. They learn the gift of hospitality and sharing. The ingredients are simple. I made sure my daughter made the list and helped me shop for them. Baking starts with planning. *Make sure you set out the whipped topping and cream cheese ahead of time so they soften. The cookie dough needs to be left out for 10 minutes before you start, too. Step 1: Press cookie dough into a 9x13 ungreased baking pan (Anna used a spatula to do this - she figured out the dough didn't stick that way - she also asked me why the pan was called a 9x13 - good question!) and bake at 350 for 14-16 minutes. Cool on a wire rack. (I invested in a good wire racks from Williams Sonoma years ago. Best. Purchase.Ever.) Make sure to cool completely or else the next step will get messy. Step 2: Beat cream cheese and powdered sugar until smooth, then fold in 1 3/4 cup whipped topping. (While doing this I'm teaching Anna what FOLD means in baking, and she's learning how to use the Kitchen Aid mixer. This is Home Economics!) Oh, and did you know these tips for handling cream cheese? Awesome. Math comes in here, too. We had a 16 oz. container of whipped topping but only needed 12 oz., so that was 3/4 of the container to be used. Spread this over the crust. Step 3: Whisk milk and pudding mixes in a large bowl. 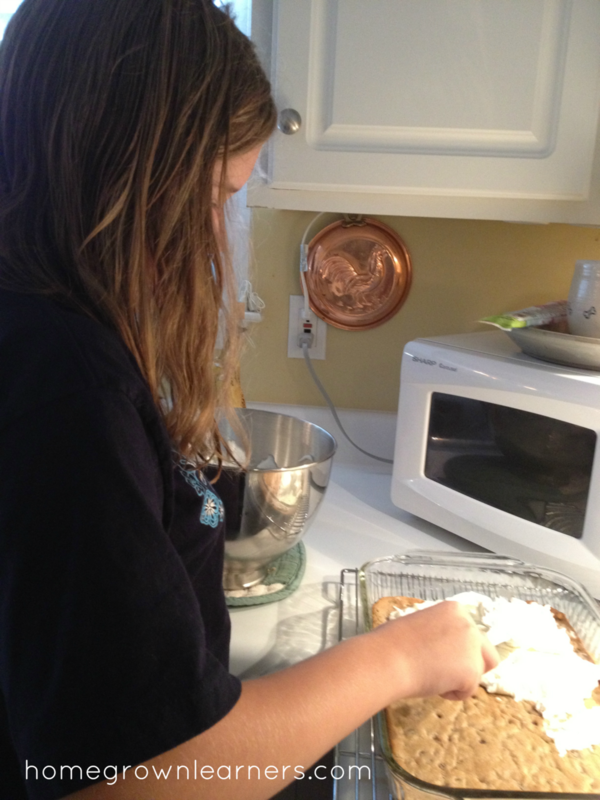 (I taught Anna how to whisk properly... it's a skill!) Spread over cream cheese layer. I also have a set of stainless steel mixing bowls that get used daily... another great investment for your kitchen. Step 4: Spread the pudding on top of the cream cheese layer. Step 5: Spread the remaining whipped topping and top with chopped nuts and chocolate curls (optional). The sense of accomplishment that came from making this was wonderful. We took it to friends' house who had invited us for dinner. At dessert time Anna was proud of her accomplishment and received many compliments. What's your favorite dessert to feed a crowd? Leave me a link, and I'll pin it to my board! Linking today with Kids in the Kitchen.